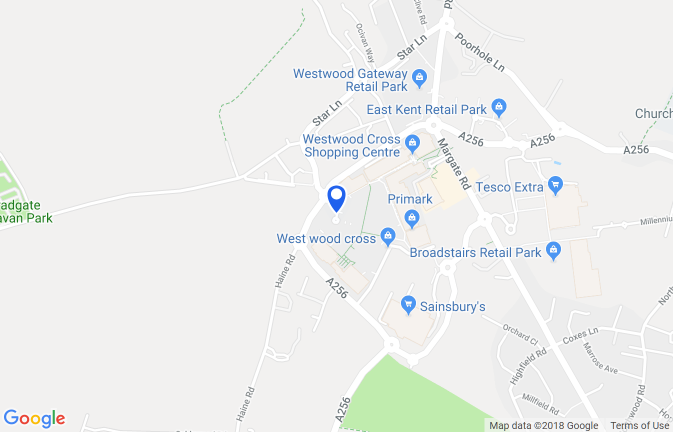 Westwood Cross is easy to find, right between the seaside towns of Margate and Ramsgate. Sat nav users should use the postcode CT10 2BF. For other directions, use the map and planning service below. Please enter a postcode / locations or use your current location to get directions. You can also select your preferred mode of transport from those available. Ramsgate, Broadstairs and Margate stations are a short bus or taxi ride away. The Thanet Loop bus service calls at Westwood Cross and runs on average every 7 minutes and operates 7 days a week, from early morning until late evening. This service provides excellent connections between Margate, Broadstairs and Ramsgate, and stops at Dumpton Park and Ramsgate train stations. Other bus services serving Westwood Cross include the 9, 11, 33, 34 and 56. Our 1,500-space car park is free and we have disabled and parent and child parking spaces which are distributed throughout. The car park is under CCTV surveillance and is partrolled by both Euro Car Parks and our own security team. *** Please note that some of the retail parks surrounding Westwood Cross shopping centre now impose parking fines after 1.5 hours. This includes The Link, which covers Smyths Toys, Vodafone, Mountain Warehouse and Poundland.